West Ham United are facing an investigation by the Football Association after their defeat by Burnley was marred by ugly scenes on and off the pitch as stewards at the London Stadium failed to stop supporters from mounting furious protests against the board. A match that was supposed to be remembered for the 25th anniversary of Bobby Moore’s death turned into one of chaos and farce as the London Stadium’s security failings were exposed again by hundreds of fans gathering in front of the directors’ box after Burnley took the lead in the second half. 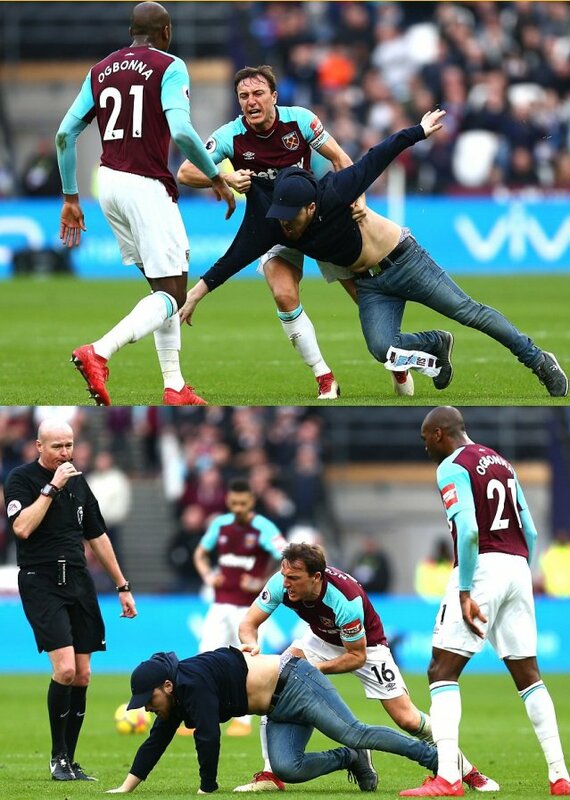 A female steward was knocked to the ground in the crush, Mark Noble, West Ham’s captain, threw one of several pitch invaders to the turf and the Metropolitan police received two allegations of assault. David Sullivan and David Gold, West Ham’s co-owners, were escorted from their seats in the 84th minute, sparking derisive jeers from the seething protesters, who chanted for the board’s removal. It is understood missiles were thrown at the directors’ box and one coin struck Sullivan in the face, however his glasses protected him from the possibility of serious injury. Some fans could be seen making throat-slitting gestures at members of the board. As disgraceful as the scenes were, however, they had always felt possible bearing in mind the ugly circumstances surrounding the cancellation of a protest march before the game. The response from security after Ashley Barnes gave Burnley the lead was bewilderingly slow. The goal stemmed from an inspired change by Sean Dyche, who replaced Jeff Hendrick with Chris Wood and saw the substitute tee up Barnes for a fine finish in the 66th minute. The mood swiftly turned sour. A fan ran on to the pitch, with no steward tackling him for at least a minute, and clashed with Noble, who threw him to the ground. While that fan was led away, two more ran on. Burnley scored again in the 70th minute, Wood turning a loose ball past Joe Hart. The striker would score his second after an error by the recalled Hart. By then attention had turned to the astonishing scene in front of the directors’ box, where hundreds of fans overwhelmed a handful of stewards. There were more pitch invasions. One fan made off with a corner flag and stuck it in the centre circle. Play stopped briefly while the referee, Lee Mason, spoke to both benches. “As a supporter you can’t cross the line,” David Moyes said. “You know you can’t come on the pitch. That’s the rules.” The West Ham manager was soon facing questions about what it would be like to have to play games behind closed doors. Both managers praised the officials for calming the game and Moyes admitted he was worried Noble would be sent off. Barnes, meanwhile, tripped one invader. It beggared belief how long it took before police appeared. Eventually, 16 officers marched on to the perimeter of the pitch. Sir Trevor Brooking, sitting on his own in the directors’ box by the end, could only shake his head in dismay as he watched his former team slump further into disarray. Why are West Ham fans so angry with their owners? What is the board’s biggest perceived failing? A lack of investment in the transfer market. West Ham’s recruitment has lacked focus in the past two years, players have left without replacements being identified and the result is an unbalanced squad. Is there a way to improve recruitment? The last transfer window ended with Tony Henry, the club’s head of recruitment, losing his job after making offensive comments about African footballers. Soon Sullivan was indicating a willingness to give more control over signings to David Moyes. But is he truly capable of taking a step back? Although Sullivan has told the Guardian that he is not the director of football, he was referred to by that title when the accounts were released last week. “David Sullivan in effect takes a Football Director role in helping to select and negotiate all football transfers alongside the manager,” Karren Brady, the vice-chairman, wrote. Nobody at the club has come up with an explanation for the publication of that line. Does that sum up the club’s PR problems? You could say that. Remarks by Brady were said to have scuppered a deal to sign Islam Slimani from Leicester in January, while Sullivan caused anger with derogatory remarks about members of the squad in December. Is there any reason for fans to be hopeful?